SAN BRUNO, CA—Touting the prestigious addition to their comedy portfolio, executives from YouTube announced Monday that a 47-second clip from the third season of Family Ties is now available on their video-sharing website. 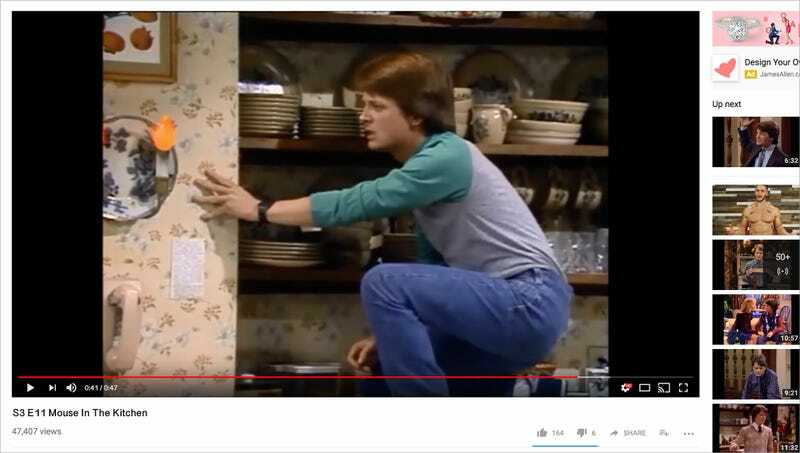 “We’re so proud to bring to the viewing public this iconic moment in which Alex P. Keaton leaps atop the kitchen counter after spotting a mouse,” said YouTube CEO Susan Wojcicki of the nearly minute-long clip excerpted from the season three episode entitled “Don’t Kiss Me, I’m Only The Messenger.” “It is an honor to share this hilarious back-and-forth between the eldest Keaton son and his sisters Jennifer and Mallory as they argue over where the mouse may have gone. Millions of viewers around the world will now be able to experience the joy of watching as Alex claims to be looking for the mouse behind a wall-mounted fixture, when in reality, he’s simply frightened by the harmless rodent.” Wojcicki went on to say that YouTube planned to release an extended three-minute version of the clip by early summer.